Rob and Janet Cuthbertson work very closely with their local Zulu communities. They believe that low-impact tourism is an excellent way to provide much-needed employment in the area and to preserve the magnificent beauty of Zululand. 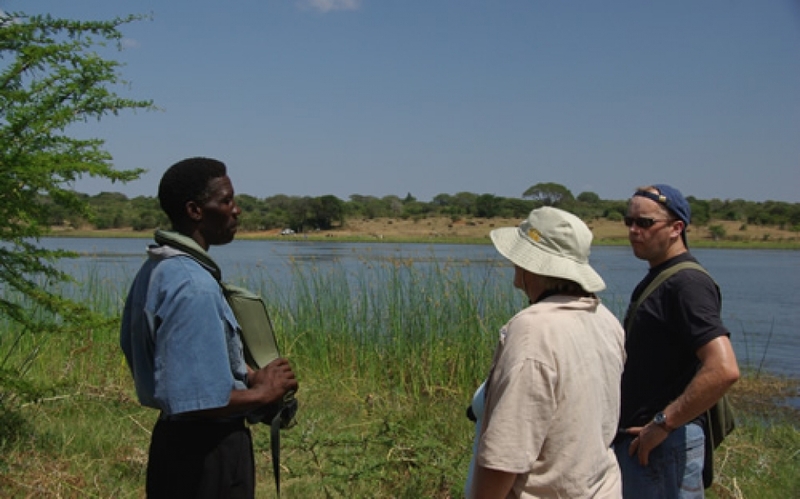 During our stay with them, they organised a guided canoeing trip for us with Temba, a Zulu guide who is perhaps the epitome of responsible eco-tourism. Not only has Temba set up his own tour operating company, he is also encouraging his community to become more involved in eco-tourism. We drove from Leopard Walk Lodge just outside Hluhluwe, on Sodwana Bay road through the corridor to Muzi Pan. Muzi is the Zulu word for home. 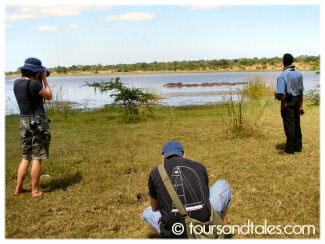 Muzi Pan is home to a multitude of species, including hippos, crocodiles and flocks of wetland birds. It’s a very important marshland area that acts as a filtration system for False Bay Lake and Lake St. Lucia, both very important water bodies for the World Natural Heritage site, called Isimangaliso Wetland Park. En-route we noticed people gathering to collect water in large drums from trucks. Apparently there is piped water, but it gets turned off at certain times, because people were filling up their tanks and selling the water elsewhere. This is a sad reminder of just how poverty-stricken this region is. The current methods of subsistence farming is not sustainable for the local communities and the land soon becomes infertile, forcing them to move on to other grounds, which inevitably brings new challenges with it such as land disputes and human-wildlife conflicts. Wildlife is mostly snared for “muti” which are potions made by witchdoctors / sangomas, as well as for subsistence meat and for the bush meat trade. Age-old forests and indigenous vegetation is usually decimated. To help preserve the environment, Janet and Rob have initiated a Young Environmental Ambassador’s Leadership Course, which shows Zulu teenagers sustainable farming methods, water and sanitation management as well as how to care for and respect their natural heritage. Coming from South Africa (and experiencing the end of the Apartheid era), it was a privilege and delight to meet Temba. He is a registered Tour Operator running his own business. What a positive, success story! He’s embracing his natural and cultural heritage and encouraging his neighbours to do the same. He can see how tourism offers a win-win solution for everyone – the communities, travellers and of course for nature and the environment. After chatting about the challenges and triumphs, Temba briefed us on the safety procedures and explained what we were going to do, then we headed out. I’m a bit of a birder … okay, I sheepishly acknowledge I don’t know enough to proclaim that “I am a birder”, but I loved seeing Jacana’s hopping around on lily pads and paddling past a flock of Whistling Ducks, ah man. What a beautiful sound. You can see Temba’s passion for Muzi Pan and his love of nature. He was pointing out little specks far away, which turned out to be large birds ready to take flight. A trained eye! Aside from appreciating the nature and wildlife of this gorgeous region, what I enjoyed most about our canoe trip, were the tid-bits explaining Zulu culture and how these surroundings are interpreted. With Janet’s involvement in wildlife protection, Temba took us to a carcass of a dead dog that had been used to bait a crocodile, which should have been snared to be utilised for muti. The Parks Board had removed the snare, but the dog was still there. There is such a fine balance between meeting the needs of people, (wild) animals and nature. Temba also demonstrated how the local folk utilize what nature has provided, as in the water lily example shown in the video, and how they’ve adapted to living alongside a pan teeming with danger in the form of crocodiles and hippos. It’s amazing to think that more people are killed in Africa by hippos than lions – the hippos look so docile and sleepy in the water! The world needs more people like Temba, Rob and Janet. They also care passionately about conserving natural and cultural heritages. As responsible travellers, we need to choose and support tour operators who are actively involved in preserving what’s precious to us.